Ok, so in case anyone is wondering, a few months ago, I told my wife, when the marathon was over, I think I wanted to give Minimalist Running a shot. 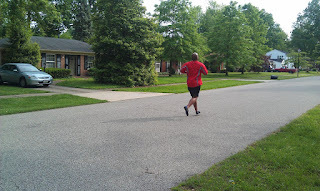 For those that aren’t sure/don’t know what Minimalist Running/”Barefoot” Running is, Click Here. My reasons were twofold: I knew I would need a new challenge once the Marathon was over, and I wanted to run with fewer injuries (duh). So a couple of weeks ago, I was in my local Sport’s store when I saw a display for Fila Skeletoes, and walked over. 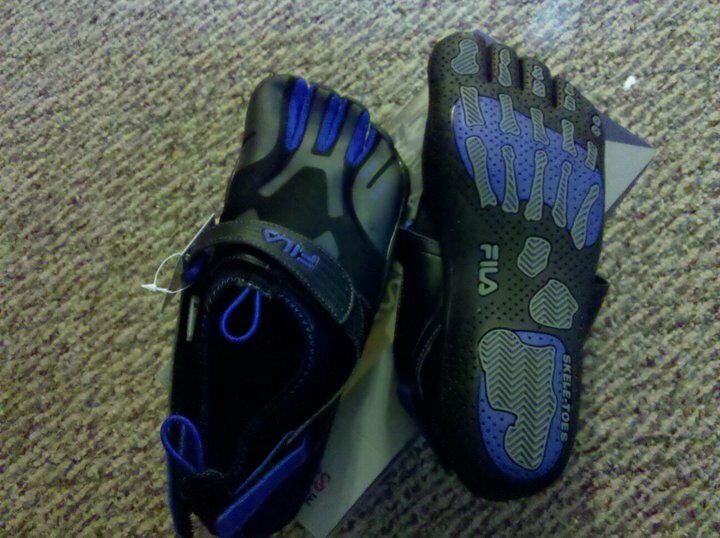 At first glance, they resemble the Vibrams, but two key points stick out, upon further glance: 1) the last two toes slide into one large slot & 2) The Price. Vibrams run around the $99 and more. These are $59.99…and they have children sizes as well! Now, the first thing I want to say is I don’t own Vibrams and haven’t worn them, so this won’t be a comparison review at all; this is just my impression of them. I am someone who NEVER wears flip flops (seriously, my wife laughs at me about this), so the first 5 minutes of wearing these felt kind of funny, but then I walked around in them, and I was hooked. The ease of sliding them on and having the adjustable straps to tighten or loosen them is great (for any athlete who has agonized if their shoe was laced correctly, tied too tight, tied too loose, etc, understands this little piece of mind)! Also, the fact that our feet naturally swell as we run, the stretch nylon/polyurethane makes sure you don’t have that arches/toes/different parts of foot go numb while out on a run, that we have all had happen more times than not. You will immediately notice how much your entire foot feels every part of every step you are taking. Not in an awkward way, but more like, there is a small part of you saying “THIS is how my muscles are supposed to feel when I am walking”. Now, I don’t do a lot (like none at all) of barefoot walking, so this is completely new to me. But all of that being said, after the initial 5 minutes, I found myself making excuses to walk, simply because I enjoyed how my feet felt in them. CAUTION, WARNING, PROCEED WITH CARE!! I have TONS of highly knowledgeable Minimalist/Barefoot Running friends who were helpful enough to tell me to ease into running with them. After countless hours of research, I read horror story after horror story of people who switched too soon, with no slow introduction, and went about their normal run in them, only to have screaming calves, fractured shins, ankles, etc. So this is why I wore them walking for a few days first to introduce the motion, SLOWLY, to my legs and body, before running in them. And when running, the best advice/data I have compiled is start at ¼ to ½ mile at the end of your normal run, and increase no more than what you started with each week until you are getting to the point your whole run is in the minimalist shoe/barefoot. I will say, my first run in them was about .67 of a 3 mile run, and I felt pretty good, and my running felt natural, more than ever before. My next run was a 30 minute run, of which I figured I would do 20 minutes in my running shoes, and 10 in the Skeletoes. Well about 15 minutes into my run, my foot felt like it hurt..and to be honest, most of that run I felt clumsy, so I made an executive decision, I went ahead and changed shoes into the Skeletoes. No pain, stride felt more natural. I will continue to slowly transition into them, because I don’t want injury, but I see that Minimalist Running will one be how I cross a marathon finish line! Protects from debris, loose gravel, small rocks, etc. Honestly, I don’t have too many Cons because I think they might be different for everyone, but nothing GLARING stares back at me. Simply put, if you are a runner who has been curious to “dip their foot” into a Minimalist Shoe, but things like price point have kept you at bay, I say try these. Also, for the seasoned runner/athlete who is looking for an alternative shoe to wear during down times, this will work too. I don't have the exact kind you have. I bought the KSO fivefingers and my friend loves them. I was never able to get over the stuff between my toes feeling and they hurt to run in. I may have bought a size to small, I am not sure. My first 3 to 5 runs I thought they were good and by the 5th run I was convinced I loved them. The 6th run though really just plain hurt and I haven't worn them since. Do you know how the ones you got differ from fivefingers by chance?? M. - The Skeletoes have a thicker sole and the last two toes are a single unit, making it a 4 toe not a 5 toe shoe. When looking at these shoes and reviews, this seemed to be the main differences. If you don't like the toes, check out Merrell's Pure Glove or Pace glove. I'm trying the Pace at the moment, Merrell makes the shoe, but it has the 5 Finger Sole on it. I need to look more into the benefits/disadvantages of minimalist running. I'm such a "country gal" anyways - someone who does almost everything barefoot... so this intrigues me. Keep us updated on your progress in them. this is the sort of review i was searching online, really nice one. i am a brisk walker & have recently ordered a pair for myself. i just wanted to know the opinions of other users online. this review is utterly helpfull. thanx so much! !